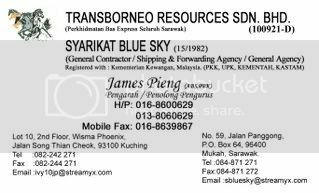 Company: Transborneo Resources Sdn. Bhd. Address: Lot 10, 2nd Floor, Wisma Phoenix, Jalan SOng Thian Cheok, 93100 Kuching.